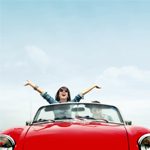 Want to spruce up your Summer ride? Grab your sponges and soap and get ready to get soaked- washing your car outside is a fun summertime tradition. Love a clean car, but don’t want to do the work yourself? Check out our Lube ‘N Shine Combos for a really professional job! If you’re going to tackle the job yourself, be sure to read your vehicle’s owner’s manual beforehand. Many car surfaces are sensitive to certain cleaning products, and you can never be too safe when it comes to risking unattractive blotches on the finish of your car. After you’ve done your homework, it’s time to start...at the ground level! Most wheel cleaners need time to work before they’re ready to be rinsed. Apply the soap there first, giving it time to work on the tough dirt that tends to cling to the wheels of your car. Use a non-acid based degreaser, since many household detergents are acidic and will cause oxidation and pitting on your tires. Next, tackle the inside. If you’ve vacuumed the interior of your car before, you know that there are always those places that you just can’t reach with a vacuum hose or brush. Use an air compressor to blow dirt from hard to reach spaces. Once it’s displaced, you can vacuum the dirt from easier to access areas. Next, use a stiff scrubbing brush to loosen up dirt from carpets and upholstery, and then vacuum. If then are any stains, mist them with a household carpet cleaner and scrub as directed! If you have a leather interior with spots or stains, use leather polish to gently shine the seats of your car. If you are a novice and think all soaps are created equal, think again. While everyone wants to be money smart, don’t use just any old soap on your car. 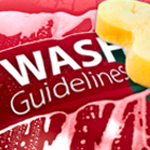 Many household detergents will strip protective waxes from the car’s exterior. Use a sponge, rather than a brush that will leave scratches, to apply the soapy water to your car. Give the car a cursory rinse to get rid of any large pieces of debris that might scratch your car as you wash. Start at the roof and work your way down the car -- from the least dirty areas of the vehicle to the most dirty. While rinsing the soap off, make sure you use the right pressure and amount of water. It’s a good idea to use a hose with a nozzle that allows you to adjust the pressure -- too high or too little will both affect how the soap is interacting with the dirt on your car. It’s time to dry, but no rubbing and scrubbing! Drying water can leave mineral deposits behind. Popular Mechanics advises using a rubber-bladed squeegee to remove those deposits. To avoid streaks, just place a clean, dry microfiber or terry cloth towel on the wet spots and pat dry. Make sure you open the doors and pop the trunk and hood of your car to find and dry any water that may have slipped in the cracks, that way water won’t make its way out of the cracks and leave watermarks on your otherwise flawlessly clean car. Remember to always wash your car in the shade and avoid the hottest days of the summer! Soaping up your car in the direct heat of the sun will cause the suds to dry before you have a chance to rinse, leaving nasty soap stains. Finally, you should apply wax to your car’s surface. Professionals always apply two coats, to cover any spots they may have missed. Waxing your car every season is essential to preventing nicks and scratches. An insider tip for a shiny finish- hair conditioner! Specifically, a hair conditioner with lanolin. Reader’s Digest did some digging and found that, in between waxes, lanolin leaves a shiny, just-waxed finish while repelling rain water and other stain-makers. While it’s fun to splash around and wash the car on a warm summer day, the job can be tedious to do regularly, especially in the winter. When ice melt and dirty snow cake onto your tires and windows, you and your car can’t function at their highest potential. Forty Fort Lube offers a “Lube ‘n’ Shine” special to keep your car running smoothly and in style. 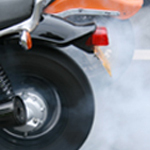 Brush the dust off your bike because motorcycle season is here! Forty Fort Lube loves bikes as much as we love cars so we’ve designated Mondays to sharing our motorcycle mania with you! Forty Fort Lube has opened up shop to service motorcycles on Mondays by appointment. Call one of our two locations and schedule an appointment for inspections, repairs, and other maintenance. We’ve tucked away our winter coats and replaced them with flip flops and swimsuits, but have we made sure our cars are ready for Summer? Just as we prepare for winter weather with snow tires and ice scrapers, we should show special attention to our cars for warm weather. Keep your car in good shape this season with this set of helpful tips from the Car Care Council. Check all fluids- everything from engine oil to windshield washer fluid. Rainstorms can be heavy this time of year so check your windshield wipers and lights to be sure you can see well and that others can see you. There are a few reasons oil change vendors put that reminder sticker on your windshield after they service your car. There’s the obvious, they want your repeating business, but regular oil changes keep your car’s engine running at smooth and clean, reducing emissions into the environment and keeping all those moving parts moving smoothly.